* LOCATION...SOUTHERN EL PASO COUNTIES. * SNOW ACCUMULATION...2 TO 5 INCHES. * WIND...NORTHEAST 10 TO 20 MPH. This entry was posted in Uncategorized on March 25, 2016 by tstoeckl. Campus is open and operating as scheduled for Thursday, March 24, 2016. This entry was posted in Uncategorized on March 24, 2016 by tstoeckl. UCCSAlert: UCCS will be closing at 1:00pm on Wed, March 23, 2016 due to hazardous weather. Classes and activities after 1:00pm today are CANCELLED. This entry was posted in Uncategorized on March 23, 2016 by tstoeckl. 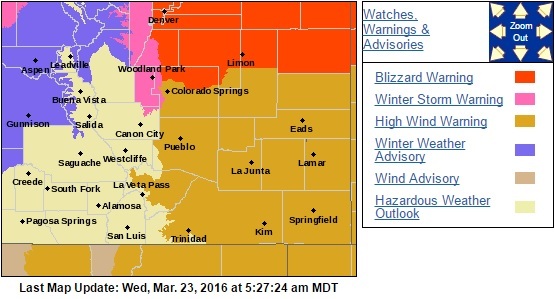 The National Weather Service in Pueblo has issued a Winter Weather Advisory for campus until 6:00pm this evening. 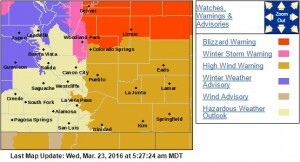 Additionally, a High Wind Warning is also in effect for our area until 6:00pm.